The 'Old Wharf' site has always been a favourite of all. With its commanding view in 3 directions and the distinction associated with its long serving history to the Denison/Wright family, it was an obvious selection for a building site.The same year that Gordon Cyril died and the Bay (centre) property passed to Charlie, the construction of 'OTR' took place. 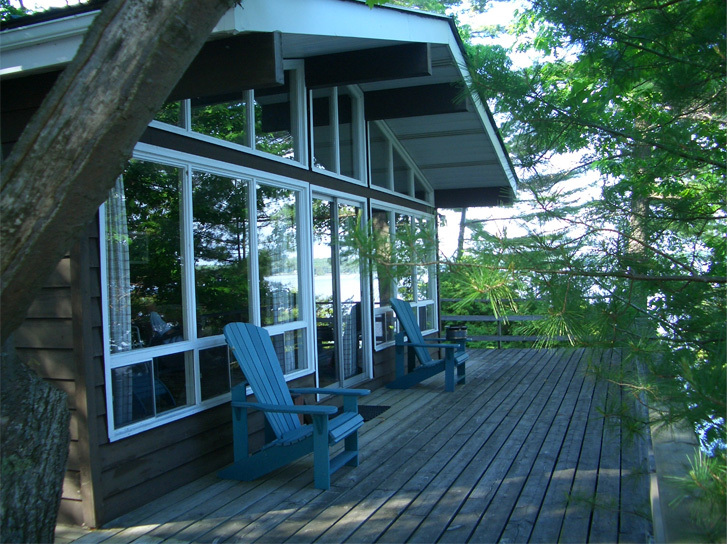 It is a 'Viceroy' cottage, a popular design in the 1970's. From the start, the construction was plagued with problems. Although none were insurmountable, their combined total made for many frustrations (hence the #2 name). 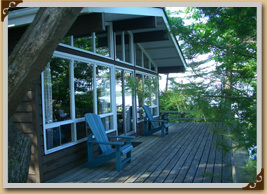 The crib for the original dock, that served the steamers, can still be seen from the deck of the cottage. Many of the rocks from this old crib have found their way into numerous crib/dock constructions over the years, including the current existing dock, situated on the southwest corner of the area. 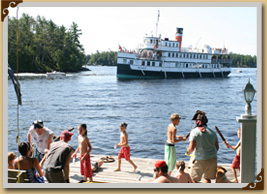 This dock has become a focal point in the lives of Beechgrove's residents plus the Segwun and the Wenonah! 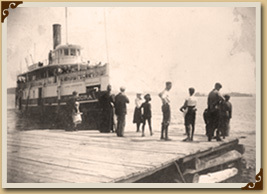 The history of this current generation's link to the steamships, started harmlessly with friendly waves to the Segwun, from the OTR deck and dock, as she passed through the "Gap". On most days, unless the wind was from the west, we could hear the dialogue of the onboard historian, as he talked about the people and the history of our own Beechgrove Is. These years starting, in the late 1970's/early 1980's, marked the renewed link to the steamers. It was then, as the Segwun was approaching, Louise Wright/Granny (Charlie's wife) would phone the Bay and alert us to the Segwun's impending passage. All life ceased in the Bay as EVERYONE with the ability to walk....no RUN....took off at breakneck speed to the OTR dock. Babies were left sleeping in cribs, children who couldn't run were grabbed....and the Bay exodus was in full force. Placards had been made, and whomever arrived first ran under the house and transported these placards to the dock! 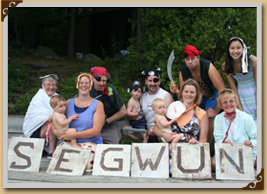 !As children and adults lined up on the dock, the 'letters' spelling "SEGWUN" were hoisted overhead...and cheers and songs ensued. The Segwun would list to port as her passengers moved to the port railings to watch the unfolding activity. The Segwun responded in kind with a special...'Beechgrove only' ...toot of her whistle!!!! 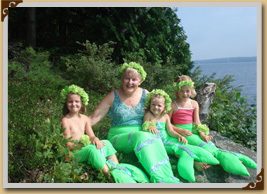 These dock performers were dubbed "the Seguinettes", and were granted special privileges with regard to Segwun cruises!!! 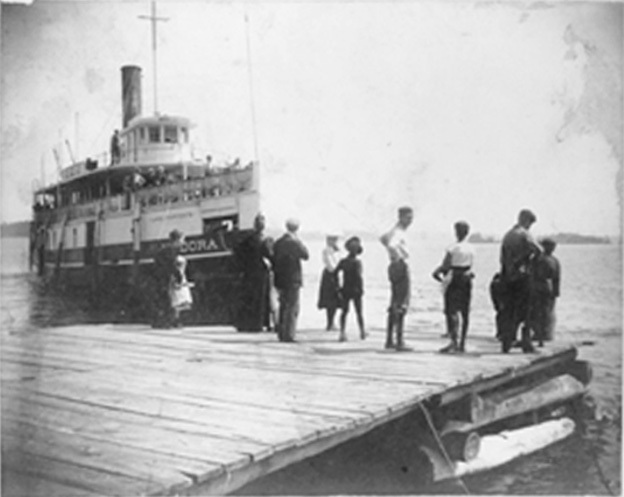 It was no surprise, when the "Seguinettes" were approached by the steamer corporation to assist in their weekly Sunday Pirate cruises that were being developed. 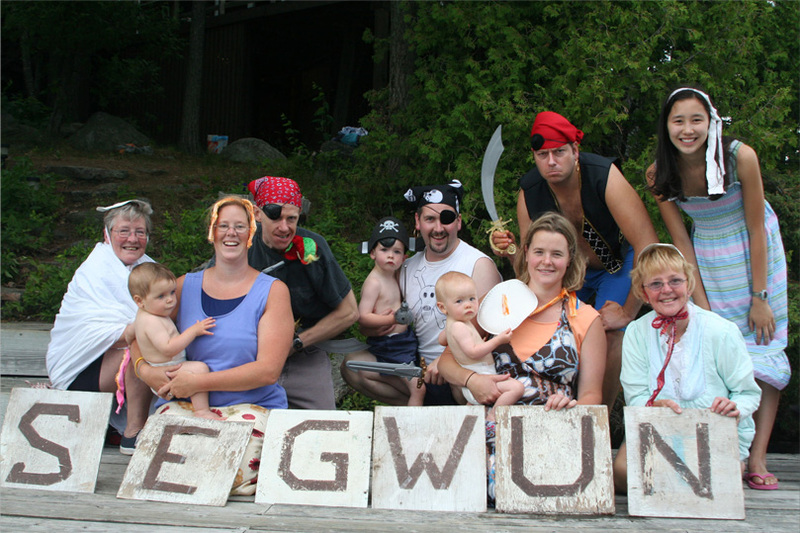 This new challenge was met with renewed vigour and Beechgrove became an integral part of the weekly children's Pirate cruises. A canon case was fashioned out of plywood scraps and the actual barrel of the canon was ABS plumbing tubing. Incendiary devices were lashe to the side of the tubing and ignited at the appropriate time. The 'maidens' (any willing female) would dress in female finery. Some maiden's graciously volunteered to walk the plank...in all manner of inclement weather, with no regard to the water temperature!!! This plank was merely 2x4's that were weekly 'screwed' in the dock for the duration of the 'show'. R.W. Gordon Wright was the 'Bob Fosse' of the production, leading his motley crew through the show. 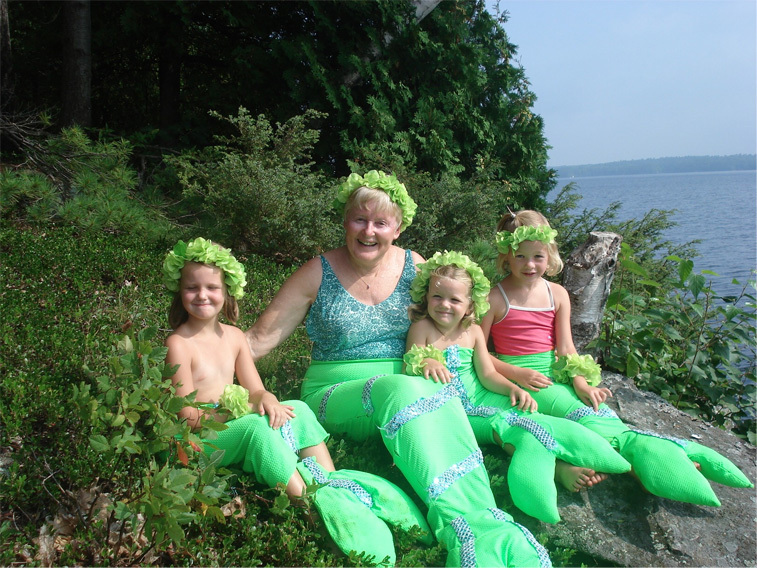 Each year another feature was added ....drunken sailor on the rock (usually a child)....priest giving the last rites (Brian), the hanging of the 'Jason" mannequin.... mermaids on the rocks (anyone willing to dress up in lime green spandex). The cast was made up of anyone brave enough to participate. Visitors quickly found themselves cast in a role, often a role not of their choosing!! Word was spread and the 'Pirate groupies' soon followed. 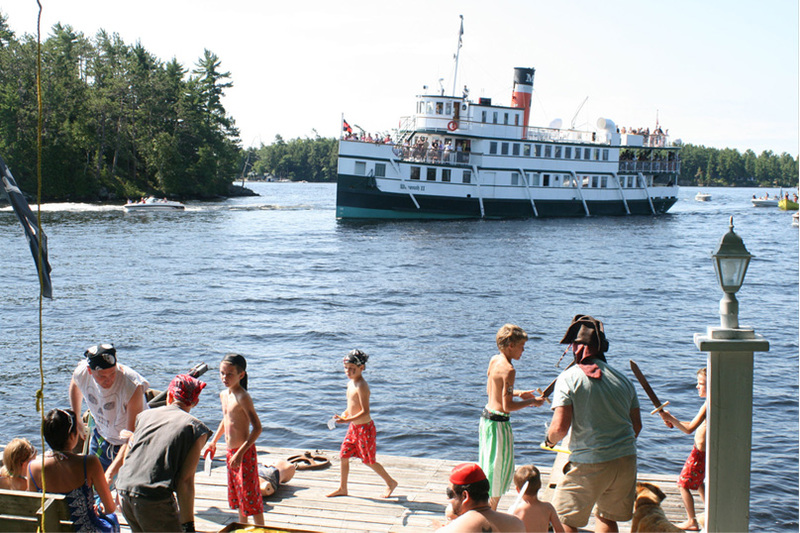 As the Wenonah approached the OTR dock, and the events unfolded, boats (sometimes totally over 25), hovered off the Old Wharf and joined into the activities in their own special ways!!!! This weekly event continues to this day!! !